No one ever said playing football was good for your brain. By this point, most sports fans have heard that those who suffer repeated concussions could possibly also suffer early-onset dementia and other neurological symptoms. This, in fact, could have lead Kansas City Chiefs’ Jovan Belcher to kill his girlfriend and himself. The leading culprit is chronic traumatic encephalopathy (CTE), a neurological disorder that seems to be common in those who play sports that lead to lots of head injuries. There still isn’t conclusive proof that more football playing means more or worse cases of CTE—the science is still in the stage of identifying correlations, not causation. But a new study’s results are shocking. Of 202 football player brains donated to science and reviewed by researchers, 177 had CTE. Of 111 NFL player brains, 110 had it. Mez immediately warned of a few caveats to this study. The researchers didn’t design the study to estimate CTE’s prevalence in football, nor are they trying to establish how football playing can change the severity of the symptoms. There’s a selection bias, meaning all of these players donated their brains to science because there was a worry they might have suffered from the disease—nearly all of them already showed symptoms. The point of the study was instead to understand the clinical features and pathology of brains at risk for CTE. The Boston University School of Medicine and VA Boston Healthcare System set up a brain bank in 2008, where a requirement for donors was that they had experienced repeated head trauma. The researchers took scans of those brains and analyzed tissues in search of specific markers of CTE. One of those markers: a protein called the tau, which changes its chemical structure in a way that causes it to tangle up with other similarly-altered tau proteins. The scientists were able to divide the cases into four stages based on these clumps of tangled “ptau,” or phosphorylated tau proteins, as well as other more advanced degenerative symptoms throughout the brain. Stages of CTE worsened from one to four, according to the paper published today in the Journal of the American Medical Association. 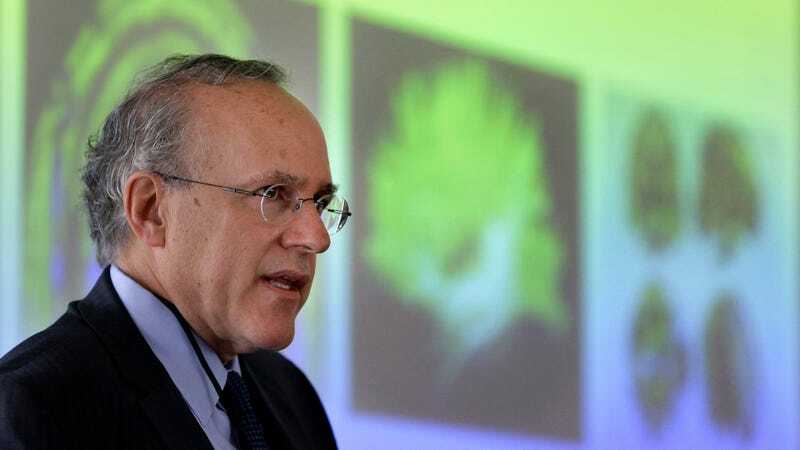 The study “represents a major contribution to this effort” to better describe CTE, Gil Rabinovici from the University of California, San Francisco Department of Neurology wrote in an editorial for JAMA. “Nevertheless, fundamental questions about the disorder remain unresolved.” What is the prevalence of the disease in the general population, for example, and how does the risk of the disease scale with the type, level, and frequency of the contact sport played? The NFL has a complicated history when it comes to concussion research. One study found the organization had tried to influence research and left out data in studies, while one story remarks the NFL had possible ties to the tobacco industry (like sharing lobbyists and lawyers), according to New York Times reports. Since then, the NFL has donated millions to the NIH to help fund research—that money partially funded the new study, said Mez. But even some of those donations have been subject to controversy. But far more research is clearly needed, because while the association between head trauma and CTE is now obvious, it’s still just an association and an obvious risk factor, rather than a proven cause. Mez thought we were only at the tip of the iceberg when it comes to understanding the disease. He noted that in mild cases, the symptoms seem excessively severe compared with the level of brain abnormality. There could be “more pathology we’re not measuring, regions we’re not examining,” he said. “It could be that the tau is the marker of a lot of other things going on. It’s important for us to understand that too.” He noted that Alzheimer’s research is decades ahead of CTE research.